Ecuador Patches Ecuadorian Air Force Fuerza Aerea Ecuatoriana FAE Squadron Crest Tac Ops Detachments Commemorative Patches. 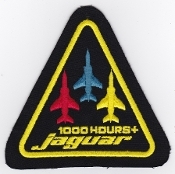 Ecuador Patch Ecuadorian Air Force FAE Escuadron de Combate 2111 Combat Squadron Jaguar 1000 Hrs Patch Badge Taura AB 1990s Emb on twill cut edge 99mm by 100mm three and seven eighth by three and fifteen sixteenth inches. 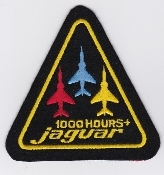 Ecuador Patch Ecuadorian Air Force FAE Escuadron Combate 2111 Squadron Jaguar 1000 Hrs Large Badge Taura AB early 1980s UK Made Emb on twill 140mm by 142mm five and one half by five and five eighth inches. 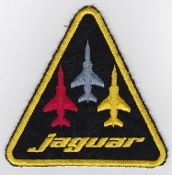 Ecuador Patch Ecuadorian Air Force FAE Escuadron 2111 Squadron Jaguar Large Patch Badge Taura AB late 1970s Used UK Made Emb on twill 116mm by 119mm four and five eighth by five and eleven sixteenth inches. More Ecuador Patches Ecuadorian Air Force Fuerza Aerea Ecuatoriana FAE patches flying suit badges coming soon.